Decorating a small bathroom is a delicate task. We're often told to keep things simple and sparse to avoid that claustrophobic feel. But this doesn't mean your small bathroom should be entirely devoid of decoration or beauty. After all, we bet almost none of our readers want a small bathroom that feels sterile or cold. An all-white bathroom can easily be livened up with a few small bursts of colour or beautiful little features. The key is to choose features that don't impede on floor space. So with that in mind, come with us to check out 9 ways to beautify a small bathroom! The walls are a fabulous opportunity to dress up your little bathroom. 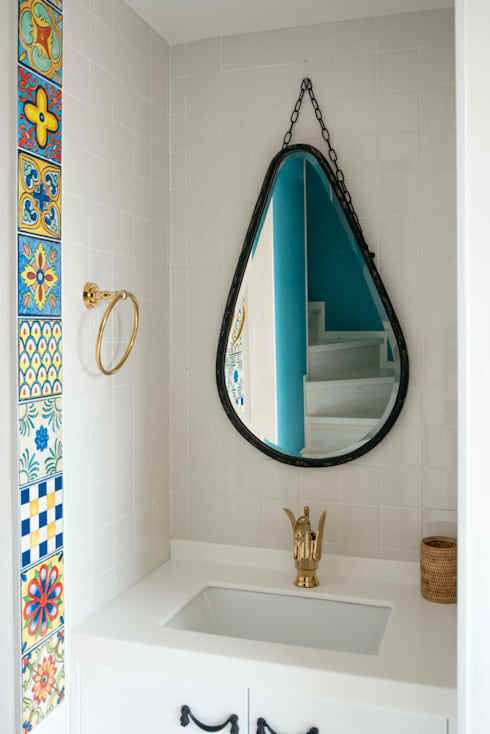 It often works to use big designs with powerful bursts of colour as seen in this little bathroom. It's important to make a big effect without making the bathroom feel busy by adding too many small and fiddly elements. If unsure, invest in some tile stickers for a less permanent solution. Be brave and go big! 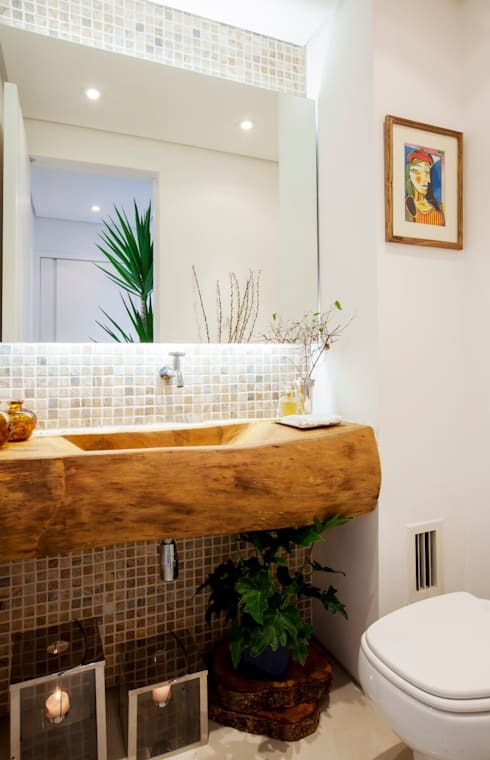 A wall made from wooden panels will add a spa-like feel to the small bathroom. They can also be used to create a boundary around the shower area without using up any floor space at all. This may seem like a big job at first, but with a little research on waterproofing and some wooden tiles it's an entirely doable option. Also, note how the dark wood on the ceiling draws your eye upwards and makes this little bathroom feel a little bigger. A wall-to-wall mirror is a common beautifying element in a small bathroom. Of course, having a mirror this big means that it's going to reflect an awful lot. Place plants directly opposite or a beautiful framed picture. Perhaps you could also add a little interior garden as seen here. 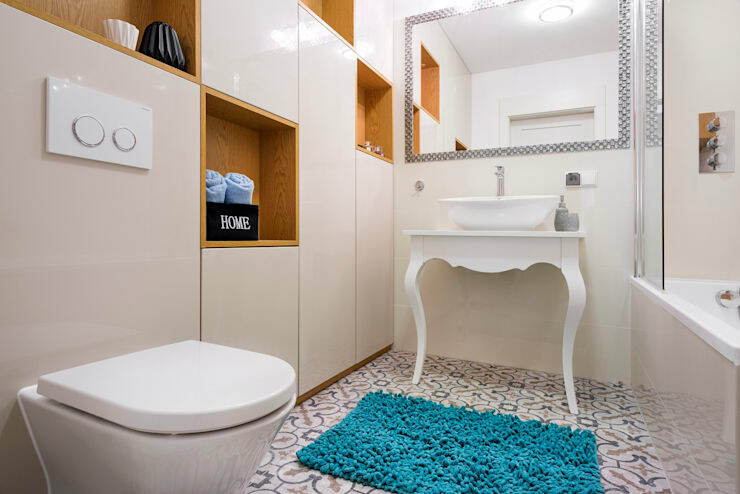 Little bathrooms tend to look cluttered with lots of small objects of varying sizes and styles. 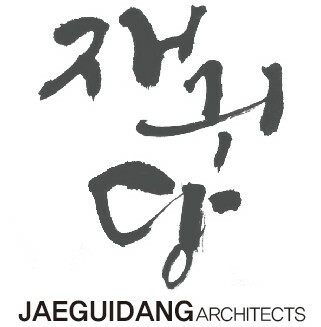 Look into creating a sense of refinement by perfectly matching various elements to create a sense of symmetry. 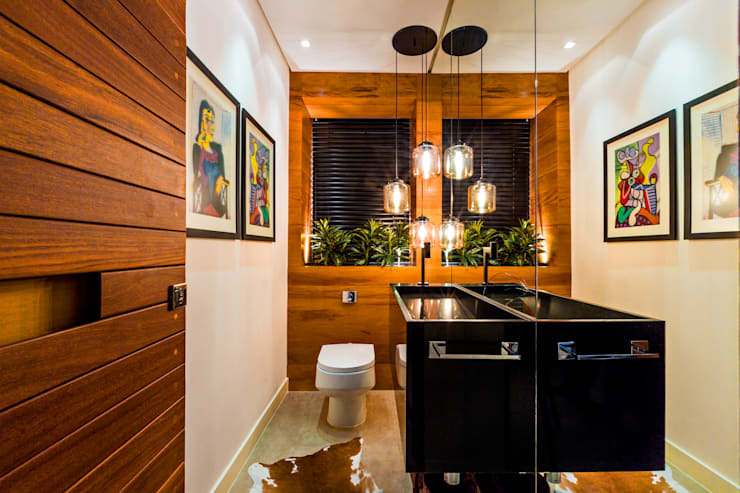 In this little bathroom, the wall-mounted lamps perfectly match the aluminium fixtures to create a unified effect. Note how the fine black picture frames are exactly the same width as the fine lines of the bathroom tiles too. We love vessel sinks because they can be used to avoid the standardised look of permanent bathroom fixtures. This kind of sink can be simply mounted on any type of table that suits the space. You might even get an old antique table with curved legs like this and add a little old-style elegance to the bathroom. If you don't have the space for a free standing table, try out some more decorative bench style combinations that run from wall-to-wall. Lots of people fall in love with decorative tiles, but they worry about it getting a little too much in a small bathroom. This is a perfectly valid concern. Instead, add a decorative strip of beautiful tile to a portion of the wall. Perhaps you could add this to a shelf instead. This most cumbersome and ungainly element in most small bathrooms is the shower stall. Look at installing a shower room instead. 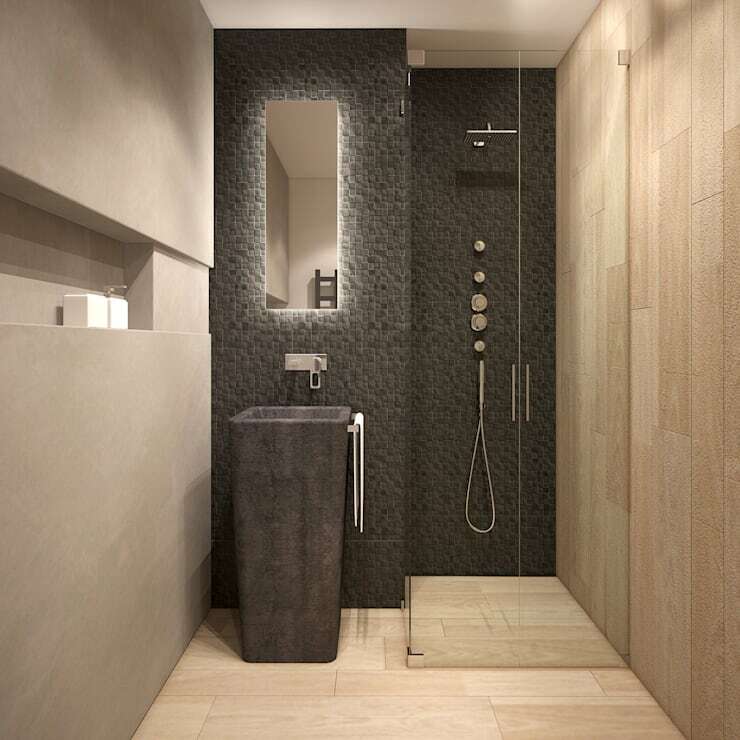 It will make the small bathroom feel larger and the transparent glass wall will create a sense of elegance too. Don't forget that this means there's more focus on the walls so your colourful tiles or feature walls will really shine. 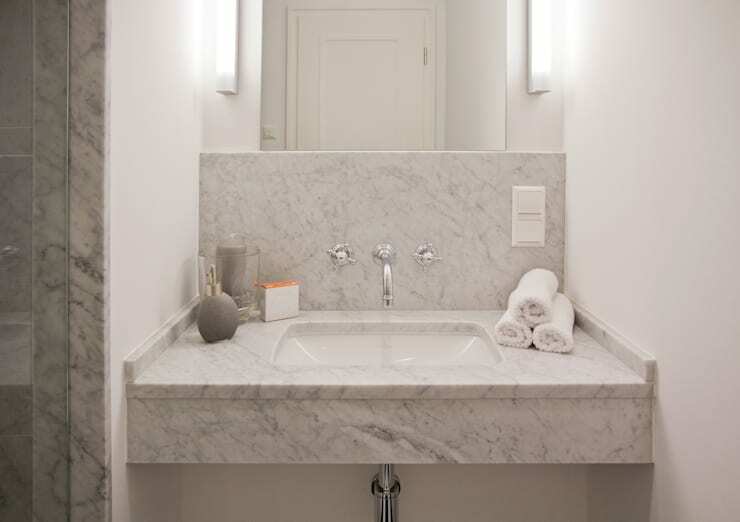 White marble and stone are features that seem to be made for the small bathroom. They work perfectly with a light colour scheme, but they also add some small sense of natural variation to the bathroom. 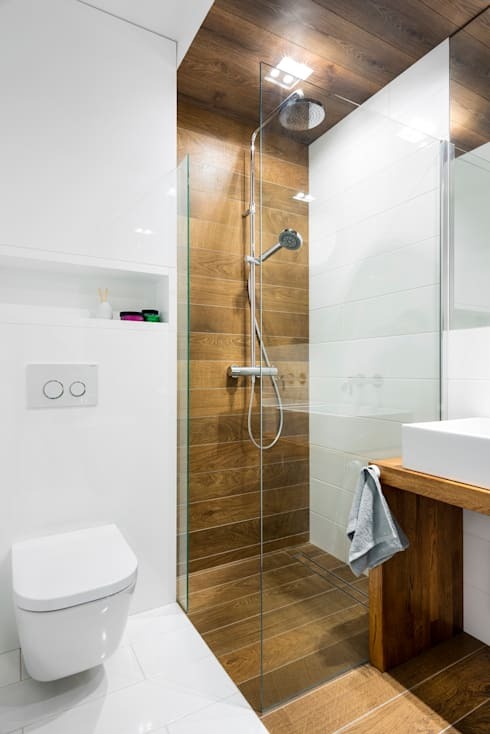 The best thing is that your costs are whittled right down because you don't need to cover a large amount of space in a small bathroom. 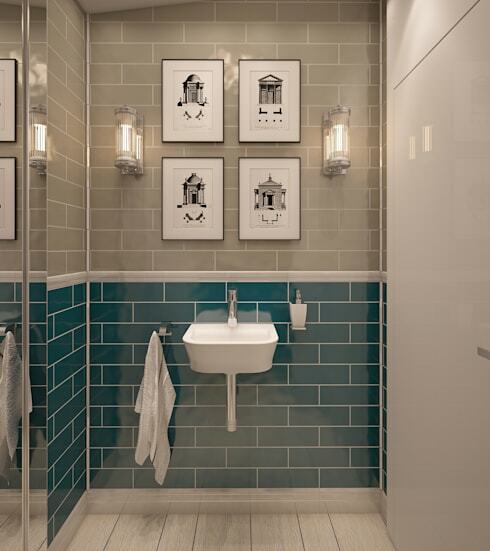 Your lighting is key to making a small bathroom look and feel clean, beautiful and spacious. Warm lighting is also really flattering for your reflection as well! Strip lights can be installed behind the mirror or on the shelves. Perhaps you could even use that unused ceiling space to install pendant lights like this. Let's turn our attention to the living areas with 8 creative shelving ideas for tiny homes. Which of these tiny bathroom features is your favourite?